Copyright: Submission of entries to the contest indicates full permission granted to SEARCA to use the photographs, with proper credit to the photographer, in knowledge packaging, sharing, and advocacy related to SEARCA’s mandate. The millions of people in Southeast Asia who depend on agriculture are among the hardest hit by the consequences of climate change, which are increasingly devastating and far-reaching. At the same time, these people are also the ones for whom climate change resilience is most essential and critical. This year’s photo contest will highlight the two opposite facets of climate change—vulnerability and resilience. 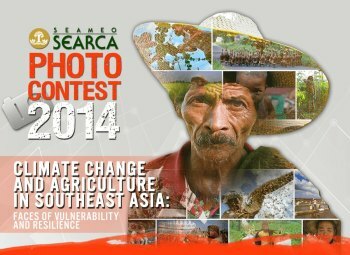 SEARCA PHOTO CONTEST 2014 will award entries that best capture how vulnerable Southeast Asian agricultural communities are to climate change OR what these communities are doing to respond to the challenges of climate change. Winners will be chosen on or about January 15, 2015. Image requirements: Only colored photos; JPEG format and at least 3,000 pixels wide for a horizontal image or 3,000 pixels tall for a vertical image at 300 dpi. Online submission of digital photographs via the website. There are no limits to the number of entries submitted.